Two Navy officials met with lawmakers today to explain the Optimized Fleet Response Plan (OFRP) for generating ready forces and the importance of sticking to the plan, which attempts to keep a stable maintenance and deployment cycle amid an uncertain world, despite the challenges associated with it. Rear Adm. Jeffrey Harley, assistant deputy chief of naval operations for operations, plans and strategy (OPNAV N3/5B), said repeatedly that OFRP is a “sustainable model” that is predicated on six-month maintenance availabilities that don’t run long and seven-month deployments that are not extended. He acknowledged that unexpected events could alter carrier strike group deployment schedules, noting that a contingency overseas or a significant maintenance discovery leading up to a ship’s availability could alter the intricate nine-year cycle the Navy has mapped out for each of its carriers and their associated strike groups. “Real world events will cause changes to the production plan – if somebody’s maintenance gets extended beyond our ability to absorb it within the shock absorber that’s built into the Optimized Fleet Response Plan, we would have to adjust accordingly and modify the schedules to be able to do that,” he told the House Armed Services readiness subcommittee. After the hearing, Harley told USNI News that “it’s [the chief of naval operations’] stated position that seven months is our goal. Any requirement to go past seven months is something that would likely be directed by the secretary of defense” in response to a crisis overseas. Therefore, in most circumstances, disruptions to the OFRP would lead to a lack of overseas presence for some duration of time, rather than breaking the CNO’s promise to sailors to keep deployments short. In the past, the Navy tried to operate under a demand-based model, in which the service tried to churn out as many ready strike groups as it could to meet the needs of the combatant commanders. But sailors were burnt out from long and sometimes unexpectedly-extended deployments, the ships’ material readiness suffered because maintenance availabilities were sometimes skipped to meet deployment needs, and maintenance work grew more expensive because the Navy could not commit to a timeline and a work scope in advance. OFRP seeks to fix those problems by offering a stable cycle of maintenance, training, deployment and sustainment periods mapped out years in advance. At issue, however, is that the supply-based model leaves combatant commanders without as much presence as they want. Under OFRP, the Navy would only produce two carrier strike groups that could be deployed at any given time, with three CSGs at home ready to surge if needed. One deployed battle group would likely go to U.S. Central Command and the other to U.S. Pacific Command, but a contingency elsewhere could pull one of those CSGs away and leave an area without a carrier for a short period of time. There will also likely be gaps between when one carrier leaves and the next arrives – a situation the Middle East will face later this fall, when USS Theodore Roosevelt (CVN-71) leaves and its replacement does not arrive for another month or two. Harley would not characterize OFRP as the cause of carrier gaps, but rather said the plan allows the Navy to generate an optimal amount of ready forces and the Joint Forces would decide how to employ them. Several admirals told USNI News that they were concerned about carrier gaps under OFRP, however. 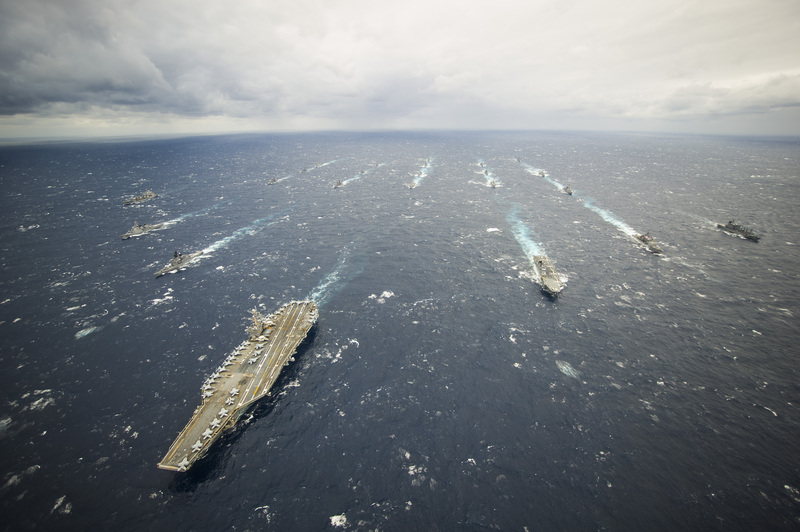 Small gaps in carrier presence in the Middle East or Western Pacific would not represent much risk if the Navy were able to keep the three surge CSGs at a high level of readiness during the 14-month sustainment phase at the end of the OFRP cycle. However, the admirals said the sustainment phase currently has no funding tied to it, meaning the battle group would fall to a reduced state of readiness and be unable to deploy at a moment’s notice to cover the carrier gap – or to address a crisis in a different part of the world – if needed. As the Navy tries to get that figure back on track with the introduction of OFRP, the federal budget situation threatens to delay some availabilities. Congress has not yet passed a spending bill for Fiscal Year 2016, which begins Oct. 1, and will likely have to pass a continuing resolution to keep FY 2015 spending levels in place for a period of time. Burke said after the hearing that the extent of the damage done by a continuing resolution would depend on how long it lasts. “If it’s a short CR, probably not much of an impact because we can work through it, we can work the funding we have to get those availabilities at the beginning of the year started,” he said.